Be prepared for an amazing range of diving experiences on your 4 day /4 night adventure to Australia's Coral Sea. Spirit of Freedom will travel to two Coral Sea Reef systems for 4 days of diving which will include Osprey Reef. Destinations will vary and be selected according to the prevailing weather in order to provide you the best diving, most comfortable conditions and maximum dive time. A couple of exploratory dives will always be included in this itinerary. Sites will vary from 3,000 ft walls to magical coral gardens to lone seamounts emerging from the ocean depths. The water is astoundingly clear and the fish life will include whaler sharks, barracuda, big eye trevally and rays as well as the exotic cuttlefish, sea hares and starry morays. Click here to view a map of the dive locations. The Coral Sea reefs feature spectacular walls, steep drop-offs and lone seamounts, rising thousands of metres from the ocean floor to just below the surface. Renown for crystal clear water with average visibility well in excess of 40 metres, a diver can appear suspended in air against a vertical wall laced with massive gorgonian fans. Sharks and schooling pelagics cruise through an amazing display of gorgonians, sea whips, and bright yellow soft corals, while nudibranch, anemones, unusual tropical fish, invertebrates, and huge schools of fish provide a rich variety of marine life. Thursday: Courtesy coach transfer from Cairns city hotels to Cairns airport will commence at 8:00am. The twin engine light aircraft will depart at 9:00am for your scenic flight over the reef to Lizard Island. Spirit of Freedom crew will greet you on arrival and transfer you to the vessel, where it will depart for the reef. This afternoon you will have the opportunity for 2 dives before departing in the late evening for Osprey Reef, in the Coral Sea. 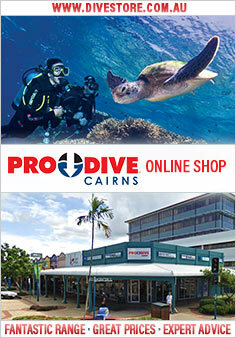 The dives may be at sites such as the Cod Hole, Pixie Pinnacle & Challenger Bay. Friday & Saturday: Osprey Reef! Australia's Coral Sea reefs are renown for crystal clear water with an average visibility in excess of 100 feet. Two days can be spent diving at Osprey Reef, including North Horn, well known for its shark action. You can expect to see grey whalers, silvertips, reef sharks, occasional hammerheads, schooling barracuda, trevally and other pelagic fish. The landscape is amazing with sheer walls laced with gorgonians, sea whips and bright yellow soft corals rising from thousands of feet below. Sunday: Option 1: Still in the Coral Sea, weather depending you will dive Bougainville Reef. Option 2: Today you return to the Ribbon Reefs to dive the sensational Steve's Bommie, Temple of Doom, Flare Point and other sites. In June & July passengers have the opportunity to interact with Minke Whales as they migrate. After dinner on Sunday evening you will cruise overnight back to Cairns. Monday: Arrive in Cairns at approximately 6:30am. Breakfast will be served onboard and hotel transfers will be arranged for approximately 7:30am. Please note that all cabins onboard have private ensuites. Due to light aircraft weight restrictions, your total luggage weight is limited to 20 kilograms/45 lb per person. All bags must be soft sided. For this trip, Spirit of Freedom recommend an Advanced Diver certification with a minimum of 20 ocean dives including 5 dives in the last 12 months. Less experience may result in limited diving due to environmental conditions. We recommend a refresher course prior to your trip.